We specialize in religious gifts that will be cherished for a lifetime and handed down for generations. Many of our items can be personalized, including patron saint medals, deluxe Sterling Silver and gemstone rosaries, and more. We aim to provide exceptional customer service with all the personal touches of a neighborhood Catholic store. If you need help finding a particular product, our friendly support team is available by phone, email, and live chat. Contact us. CatholicShop.com spares no expense to provide a safe SSL-certified shopping experience, and our website is optimized for your computer, smartphone, or tablet. Be sure to like our Facebook page for free giveaways and offers, and watch our Sale page for the latest discounts and deals. Orders over $40 get free domestic shipping, or you can upgrade to any of our affordable express shipping options. All orders are insured free of charge, so no more worrying about an expensive order. Plus, every item comes with a 60-day money back guarantee. Thank you for shopping at CatholicShop.com! This 10-inch Classic Guardian Angel Figureurine is part of our Joseph Studio-Renaissance collection. Our 14K Gold 26x18 MM Oval Miraculous Medal features our 60-day money back guarantee and free Shipping Insurance, as does our entire line of religious jewelry. Part of our Religious Pendants line, this Miraculous Medal features a weight of 2.31 DWT, which is the equivalent of 3.59 grams. This Holy Water Glass Bottle - LOURDES can only be purchased in these bulk lots of 12 units at a discounted wholesale price, which is now available to the public. These discounted bulk packs offer the perfect solution if you want to give these Catholic goods away as gifts or to use as free envangelizing tools. Imported from Italy. Approximately 2-1/4 inch tall, holds standard .5 floz. Bottles do not contain Holy Water. This 14K Yellow Gold St. Christopher Medal measures 08 mm, roughly equivalent to 5/16-inch. The weight of this particular piece of religious jewelry is 0.34 grams. It comes ready for gift-giving in an attractive jewelry box. This Miraculous Medal available from CatholicShop.com features dimensions of 12 X 8 millimeters, approximately 1/2-inch by 3/8-inch. Made of 14K White Gold, this religious jewelry piece weighs approximately 0.7 grams. It comes ready to give as a gift in a free deluxe gift box. 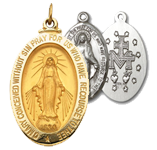 This 1-1/2-inch Miraculous Medal can only be purchased in these bulk lots of 25 units at a discounted wholesale price, which is now available to the public. 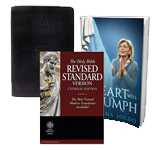 These discounted bulk packs offer the perfect solution if you want to give these Catholic goods away as gifts or to use as free evangelizing tools. Imported from Italy. Our Adult St Peregrine Pewter bangle bracelet has a charm that we can engrave for an extra fee and features our money-back guarantee. The film Apparition Hill follows seven strangers who embark on a life-changing journey to a place of reported miracles. Our Blue Miraculous Auto Rosary is designed to hang on the rear-view mirror of your car, but it can be used virtually anywhere. Like all of our products, it comes with our money-back guarantee. This Guadalupe Decade Wood Rosary Bracelet with Olive Colored Beads is from the renowned Goldscheider collection. 60% OFF - ONLY A FEW LEFT AT THIS PRICE! - Our 6 Millimeter Bead Crystal Lourdes Rosary features a centerpiece filled with genuine Lourdes water. In 1858, the Virgin Mary appeared in Lourdes, France to a peasant girl named Bernadette. A miraculous spring burst forth from the place of the apparition, and people have been flocking to Lourdes for the water's healing powers ever since. Our Lourdes rosary has a Pewter Crucifix and Center. The centerpiece is clear on one side to show the holy water, and on the other side is a detailed image of Our Lady appearing to Bernadette in the grotto at Lourdes. A Deluxe Gift Box is included. NOTE: The photo only shows part of this product, but the 6 Millimeter Bead Crystal Lourdes Rosary is a full rosary. ON SALE NOW - Our Pewter Miraculous Medal features an 18-inch Chain And Gift Box. 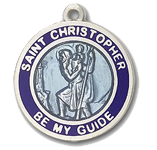 The back of the medal has the traditional Miraculous Medal design. This is a high-quality Miraculous Medal at an exceptional price. 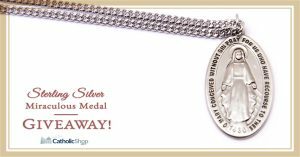 Our Pewter St Maria Goretti Medal features our money-back guarantee. Show your Catholic pride with our Pray for Our Priests Euro Sticker from CatholiCar. This unique Euro-style design by CatholiCar is a simple peel-and-apply decal, printed in black ink on white vinyl. Made to last! 5mm Red Polished Beads Deluxe Crucifix and Center 18'' Gift Boxed. 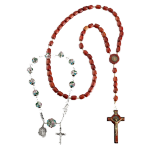 This Red Enameled Confirmation Rosary Boxed features the CatholicShop.com money-back guarantee. Our St Maria Goretti Prayer Card Set features our money-back guarantee. 3/4 x 1/2-inch Sterling Silver St. Dymphna Medal. 1 x 3/4-inch Sterling Silver St. Francis of Assisi Medal. Sterling silver double sided Scapular medal showing the Sacred Heart of Jesus on the front and Our Lady of Mount Carmel on the reverse of the first medal. On the front of the second medal is Saint Simon Stock receiving a scapular from Our Lady and on the reverse features the Scapular Promise. Die struck using only the finest grade sterling silver enables the fine details to fully show when the antique finish is performed on each medal by New England Silversmiths. Hand engraving is then applied to the medal followed by lacquer to help prevent tarnishing. The 7/8" medal comes with an 18" genuine rhodium plated chain in a deluxe velour gift box. This Sterling Silver Two Piece Scapular Medals is made in the USA. 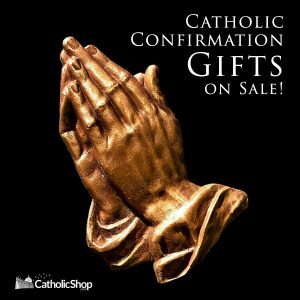 Catholic Confirmation Gifts - On Sale Now!